As world's finest athletes gather for the Twenty-third Olympiad, politics and international rivalry again threaten to overshadow the colorful spectacle. EVERY four years the world watches the supreme effort of sportsmen striving for their Olympic triumph." So writes Juan Antonio Samaranch, president of the International Olympic Committee (IOC), in the foreword to the book The Olympic Games, 1984. "Healthy competition and fellowship," continued the IOC's chief executive, "are needed more than ever today in strengthening the desire for peace and lessening the effect of political conflict." Olympic ideals, however, often contrast with the grim reality of the world. Again, in 1984, as in previous Olympiads, the Olympic ideal and its motto Citius, Altius, Fortius — Swifter, Higher, Stronger — are marred by the powerful forces of nationalism. On May 8 United States Olympic officials were stunned at the announcement that Soviet athletes would not participate in the Games of the Twenty-third Olympiad. The official TASS agency said Soviet athletes could not be safeguarded against expected political demonstrations. This year's Summer Olympiad is in Los Angeles, California, also the site of the only other Summer Games held in the United States (in 1932). About 10,000 athletes and 2,000 coaches from 150 nations had originally been expected to attend. 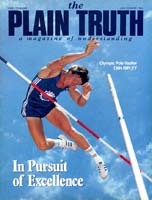 The Los Angeles Games have been popularly referred to as the "Capitalist Olympics," partly out of contrast to the 1980 Games in Moscow, the first summer event ever in the Communist world, but mostly because of the number of corporate patrons who have paid sizable sums to be classified as "official sponsors" of the events. Unlike in Montreal, Canada, site of the 1976 Games, where escalating costs saddled the citizens with a huge financial burden afterward, the residents of Los Angeles and Southern California are not expected to be impacted with increased taxes. Another key to limiting the costs of the 1984 Olympics is the policy of the LAOOC to use existing facilities as much as possible. Except for a swimming pool and a velodrome (a stadium for bicycle racing), no major structures have been constructed. Instead of a new "Olympic Village," existing university dormitories will house the athletic teams. The television coverage will be an Olympian task in itself. No expense is being spared in developing a new range of specially designed cameras on vehicles. As one TV critic told The Wall Street Journal: "The Los Angeles games will be the most leviathan deployment of hardware, rolling and airborne stock, engineering, production, on-air and managerial manpower for any self-contained event short of a shooting war in the 40-year history of television." An ABC official added, with only slight exaggeration: "There'll be so many helicopters in the sky during the Olympics, Los Angeles will be like Vietnam." The organizers of the Los Angeles Games have hit on what they expect will be a winning formula to finance the Olympics. But no one has yet come up with the formula to defuse the divisive forces of nationalism and the desire to win at all costs that together have hung like a black cloud over the past several Olympiads. The IOC, the chief ruling body of the Games, has continuously found itself in the middle of political disputes and intrusions, especially since the Winter and Summer Games in Germany in 1936. At that time the 10C ran head-long into the plans of Nazi Fuhrer Adolf Hitler to turn the Games in Garmisch-Partenkirchen and Berlin into showcases of Aryan supremacy. The Berlin Games, in particular, scored a major propaganda victory for Adolf Hitler. Despite the Fuhrer's much — publicized embarrassment over the sterling performance of the black American athlete Jesse Owens, Germany still walked away with the largest overall number of medals. The prestige of the Third Reich soared at home and abroad. Joseph Goebbels, Adolf Hitler's Minister of Propaganda and Enlightenment, claimed that the 1936 Olympics were worth 20 divisions to Nazi Germany! The Olympic Games were postponed for the duration of World War II. They resumed in London in 1948 and in Helsinki, Finland, in 1952. The Helsinki Games were considered by many to be the happiest since the modern Games were resumed in 1896 in Athens, Greece. They appeared to come closest to the original Olympic ideals. However, the seeds of future division and dissension — in the form of the burgeoning East-West rivalry — were sown at these contests. The Soviet Union, unexpectedly entering the Games for the first time, was permitted to set up a separate Olympic Village for its athletes, along with those from Hungary, Poland, Bulgaria, Romania and Czechoslovakia. "This broached the Olympic spirit," writes Peter Wilson in the book The Olympic Games. J 984. "It is hard to understand how the International Olympic Committee, which had strained at so many gnats, allowed itself to swallow this particular camel. Probably they were anxious to accommodate the lost sheep which had returned." With the inclusion of the Communist East bloc, there developed, more than ever, an emphasis on the medals won not by individuals, but by national teams. At one stage in Helsinki, it looked as though the U.S.S.R. was going to win in the unofficial point-scoring system. In fact, so sure of victory were the Russians that they had a large scoreboard constructed showing the relative positions of the various competing countries. Toward the end, however, the United States came with a rush, winning no fewer than five gold medals in the boxing competition. As soon as the Russian officials saw they were going to be overhauled, they began to dismantle the scoreboard, but not before an American journalist spotted the demolition in process and headlined an article, "Russians Caught With Points Down." The Soviets were determined not to be upstaged again, however, and in subsequent Olympiads sent formidable teams. The Games in Melbourne, Australia, in 1956 were conducted under the shroud of the crisis in Hungary and the summer war in the Middle East. The Netherlands, followed by Spain, pulled out in protest over the Hungarian situation. Egypt withdrew after demanding that nations "guilty of cowardly aggression against Egypt" (meaning Israel, Britain and France) should be expelled from the Games. Lebanon followed Egypt. The People's Republic of China also withdrew because the Republic of China (Taiwan) had been allowed to compete. The intra-Chinese rivalry was to continue in subsequent Games, to come to a head in Montreal in 1976. A very Brundage, president of the IOC, meanwhile insisted: "We are dead [set] against any country using the Games for political purposes, whether right or wrong. The Olympics are competitions between individuals and not nations." Reality, however, was just the opposite. The way was being prepared for further political disruptions. The breakup of the colonial empires in the late 1950s and the subsequent emergence of new nations in Africa and elsewhere had their impact upon the conduct of the Olympics as well. Specifically, pressure began to be brought upon the Republic of South Africa, which had through 1960 fielded all-white teams. Consequently, South Africa was not invited to send a team in 1964. A threat by 40 countries to withdraw from the Games in Mexico City in 1968 influenced the IOC to again withdraw an invitation to South Africa. Finally, succumbing to the pressure, the IOC expelled South Africa in 1970.
International disputes continued to plague the Olympics, threatening the very existence of the Games in 1972 in Munich. Even though white — ruled Rhodesia (today Zimbabwe) complied with all IOC requests — namely, it should compete under the British flag and anthem rather than its own — a big row over its participation erupted right on the eve of the Games. Two weeks before the Games were to start, 20 countries vowed to withdraw if the Rhodesian team was all owed to compete. Then the most terrible event in the history of the Olympic Games occurred on September 5, 1972, the 11th day of the Munich spectacle. Eight Arab commandos of the . "Black September" organization entered the Olympic Village in Munich and commandeered the Israeli team's residence. After 20 hours of high drama ending in a police shoot-out, 11 Israeli athletes and five commandos lay dead. The 1976 Montreal Games were marred by more bitter political disputes. The first one involved the unsettled issue over which China would be the official China. The People's Republic of China — which had walked out of the IOC in 1958 over the issue of Taiwan's representation — brought pressure to bear on the Canadian government to exclude Taiwanese athletes from competition. Canada, enjoying a profitable commercial agreement with Beijing, bowed to the pressure and informed Taiwan that its athletes would not be all owed to compete under the name "Republic of China." Moreover, the Taiwanese would not be permitted to fly their national flag nor to play their national anthem at the Games. A heated controversy erupted. The United States threatened to pull its team out in protest. A compromise proposal was quickly drawn up: Taiwan would be allowed to fly its flag and use its anthem, but it could not call itself China. Though Taiwanese athletes were already in Montreal, their government refused the terms and brought them home. No sooner had the Taiwan case been resolved when 20 African nations, plus Guyana and Iraq, announced that they would boycott the Montreal Games if New Zealand took part. Why? Because a New Zealand rugby team had toured South Africa earlier that year. Olympic officials were dumbfounded. Rugby had not been an Olympic sport since 1924 and consequently the IOC had no jurisdiction over it. Besides, many rugby players, other than New Zealanders, were regularly playing games in South Africa. The IOC executive board unanimously rejected the ultimatum. The very day before the Games were to begin, the 22 dissenting countries withdrew their 441 athletes. The crowds in Montreal's new Olympic Stadium were denied the pleasure of seeing some of the finest runners in the world. The Soviet Union spent an incredible sum of money in preparing for the Moscow Summer Games of 1980. Had the Soviet organizers known what was to follow, they could have saved some money. Because Soviet troops had entered Afghanistan in December 1979, the United States and 61 other nations boycotted the Moscow Games, the largest such action in Olympic history. Sixteen other teams paraded under the Olympic flag rather than their own as a gesture of protest to their Soviet hosts. In his speech concluding the ill-fated Games, retiring IOC President Lord Killanin made the following appeal: "I implore the sportsmen of the world to unite in peace before a holocaust descends. ... The Olympic Games must not be used for political purposes .... The Olympic Games are for the benefit of our children." Another appeal to the deaf? "We are convinced that once again we will demonstrate to the whole world the meaning of sport as an illustration of friendship and fraternity." Observers in Sarajevo, however, were quick to notice the visible lack of fraternity. Tight security kept athletes from the various countries from mixing freely. And now the Olympic spectacle moves on to Los Angeles.. All year controversies have been building up. And real trouble usually erupts on the very eve of the opening ceremonies, maximizing the amount of disruption. Soviet authorities, even before their decision, had voiced concern. Annoying to the Soviet delegation was the avowed attempt by one group to encourage athletes from Communist countries to defect to the West. Said the group's leader: "We want 50 [defectors] from the Eastern bloc, but we'll be satisfied with five to ten." The Soviets will certainly weigh such threats. South Africa is once again at the center of controversy on two counts. First, there exists the possibility of a last-minute mass boycott by African nations. In a case reminiscent of the 1976 Montreal disruption, the Games may be disturbed over the scheduled tour of another rugby team to South Africa, this time from England. Then there is the case of Zola Budd. She is a remarkably gifted 17-year-old barefooted runner, at 84 pounds a sinewy wisp of a girl. She is the world's fastest woman at the 5,000 meters. Her record doesn't count, however, because times of South African athletes, whether they be black or white, are not recognized internationally. Because her paternal grandfather was British, Zola has been able to obtain a British passport and is scheduled to run on the British team. Anti-South African groups are upset at this development and "are demanding that young Zola publicly denounce the country of her birth as a price for being able to run in Los Angeles. In perhaps the most unusual development, representatives from the Palestinian Liberation Organization (PLO) have been pushing for permission to field a team. It is unlikely that the IOC will accede, citing the requirement of "territorial extent" for representation. On it goes, controversy after controversy. Nationalism and the drive for the accumulation of team medals have all but overwhelmed the basic intent of the modern Olympics as expressed by its founder, the Frenchman Baron de Coubertin, who said in 1908 : "The most important thing in the Olympic Games is not to win but to take part.... The essential thing is not to have conquered but to have fought well." "I am opposed to nationalism and I would be happier if national anthems were not used at the Games, but I realize that my view is not that of the majority. There is no doubt that some of the larger powers wish to retain the present medal ceremony and many of the newer nations, although it may be some years before their anthem is played or national flag raised, eagerly await their day" (The Olympic Games. 1984, page 20). Looking back on the progress of the Games, Lord Killanin also believes "it may have been a mistake" to introduce team games (such as team handball, volleyball and basketball) since these emphasize national rather than individual accomplishments. The insatiable "quest for the gold" has gravely impacted individual efforts as well, whether done in the service of a country or not. Olympic officials decry the alarming spread in the use of anabolic steroids, by which muscle bulk can be increased rapidly and to an unnatural degree. The IOC promises strict computerized detection measures in Los Angeles. The problem of drugs affects countries in both the East and West. American hurdles champion Edwin Moses said in 1983 that at least 50 percent of America's Olympic athletes take illegal drugs. "As a track-and-field athlete who doesn't use drugs ," remarked Moses, "I now consider myself to be in the minority." The ban on steroids has led to the search for less traceable substances. One such substance is a human growth hormone, a potent "strength juice" derived from the pituitary glands of cadavers and priced at US $500 for a three-week supply. With many events now open to female athletes, the IOC and various international sports federations have been compelled to introduce femininity tests to make certain that no men or so-called super-females (those having an extra "X" chromosome) unfairly compete against normal females. Many women athletes understandably have recoiled against having to have a "certificate of femininity" in order to participate. Lord Killanin is blunt about the drug abuse prevalent in international competition. "If scientists are going to create 'artificial' athletes," he says, "to compete in the Olympic Games or any international sport, then the sooner the international competitions are ended the better. Sport is about the attainment of the complete man or woman, physically and mentally, by natural, and not artificial, means" (The Olympic Games. 1984, page 22). One observer, viewing the problems of staging this year's events in Los Angeles, remarked: "I thought the Olympic Games were supposed to be a break from the problems of the world. They're not." Neither should they be expected to be. The Olympic Games unfortunately reflect not the ideal of universal friendship and fraternity but rather the stark reality — in microcosm — of the rivalries and hatreds among the nations of the world. Since the world is divided into competing nationalisms, ideologies and religions — divided, in fact, against itself — we should not expect that the greatest athletic festival the world has to offer should be any different. Not all competition is wrong, as editor in chief Herbert W. Armstrong explains in his "Personal." However, this world and all of its institutions, including its athletics, have absorbed the form of competition espoused by Satan the devil, the invisible ruler of this world — competition based upon selfishness, on hostility and, if need be, harm to one's opponent, in order to get ahead at another's expense. As a result, the international system of this world is riven with such evil results as "hatred, contentions, jealousies... selfish ambitions, dissensions ..." (Gal. 5:20, Revised Authorized Version). It can be chivalrous or corrupt, vile, bestial. One can use it to consolidate peace or prepare for war." It is the evil fruits of selfishness, hostility and strife that, in the Olympics, have tarnished the often spectacular accomplishments of athletic endeavor. Will there be Olympic Games, or athletic competitions similar. to them, in the coming world tomorrow? The Bible does not specifically answer this question. However, the Bible says in regard to sport that bodily exercise "is profitable" (I Tim. 4:8) — although "godliness" — righteous behavior — is much more so. So there is reason to believe that in the world tomorrow, after all the nations of this world have become subject to the kingdom of God — which will eliminate distrust and rivalry on the international level — there may be athletic spectaculars to far surpass anything this world has had to offer.